WHG originated in Europe and almost completely restricted to Europe today. @Davidski, can you repost the link for the light hair/eyes in Andronovo? The study I have in mind is actually pretty late, closer to Saka/Scythian Iron Age (horseback riding, originating from Assyrian military tech if I remember. They were the master innovators in that field in early 1st millennium BC, btw). Not blond, but could be European looking or even Slavic looking. Notice the hair style, looks almost fashioned to imitate a horse mane. Btw, we should talk more about mtDNA study of Siberia (shows new Mideastern myDNA haplogroups after 800 BC if u recall). Some of those hg shows up in East Europe too if I remember. 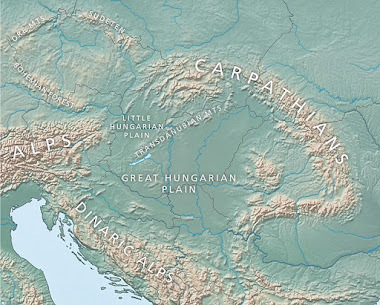 I don't dispute some kind of steppe connection, I'm just not sure exactly what/when/directionality. When info comes out on La Brana 2, can that be put into the WHG instead of Loschbour? Depending on North African or early EEF admixture of course. Or perhaps using Motala samples as Northern Europeans are probably more of this type. If full genomes of Motala and La Brana 2 become available do you think that they can be used as better examples of WHG? Maybe breaking up WHG into 3 separate components (SW-La Brana, W-Loschbour, N-Motala) can give a better idea of what the true percentage is with regards to regional variation. A Balkan WHG would be very helpful to this whole EEF thing. Is this kind of fine-toothing possible with multiple variants of WHG? "India is a head scratcher no matter which theory is on the table. Very high levels of R1a without any accompanying autosomal component from East Europe or f_3 stat showing ANE mixture." In South America they have people with Amerindian mtDNA but autosomally almost completely Euro. How might the same happen in reverse? Over enough generations wouldn't polygamous raiders end up like that i.e. they eventually become like the people they raid? "Personally, I think Europeans got a lot of what seems like "Europeanness" from EEF." I think EEF is more like "Caucasianess" ("White Race") in general. Something that Europe, middle east and north Africa have in common. Much more likely to be responsable for "Europeaness" would be WHG. Because its unique to Europe. So by pure logic, it MUST be whatever seperates Europeans from Non-European Caucasoids. EEF makes a Caucasoid, and WHG combined with EEF makes a European caucasoid. @Fanty, my thought exactly in terms of old understanding of Mediterranean skeletal morphology. I also think this is the case wrt behavioral adaptations, especially social adaptations for for living in dense settlements. This would be very stressful for some archaics IMO. Just like many animals languish or even die when taken into captivity (too many stress signals, not enough free movement, complexity of hierarchy as social networks, etc). I imagine that if you were to meet a WHG/ANE person, they might be in some ways familiar and in some ways strange or maladapted for modern living. There are people like this. Many Aminds prefer to live with their own people on reservations (even in severe poverty) instead of the white mans world - which I submit is the EEF adapted world (with necessary help from tougher WHG many times in prehistory). I'm wondering what could explain the significant difference between the "Basque" and "Pais Vasco" results? Is "Basque" actually French Basque? It looks like an error, probably because of the small sample size. The Pais Vasco sample can be fit as EEF/WHG with no ANE, the same as the Basques (who are indeed French Basques). So their ANE admixture is much less than 16%. It looks like the algorithm is confusing WHG for ANE in this case. Thanks. But you still believe that the French Basque sample is accurate, right? And if I understand correctly how this works, my being relatively close to this sample (EEF 59,46724; WHG 28,3403; ANE 12,19247) should mean that my ancestors have likely been Basque-related people for at least 8,000 years? No, I think the ANE score is also too high for the Basques in the study. Again, it seems their WHG is being confused for ANE. You definitely have more ANE than them anyway, because you cluster with the main French reference set. So you're much less like the Neolithic inhabitants of France than Basques are. But I don't know if those estimates are more reliable than the ones you proposed in the comments of this article? Also, it looks like there's a positive correlation between ANE and WHG. They seem to be high wherever EEF is low, and EEF is high where they're low. If I read you correctly, this is because ANE and WHG formed a distinct people very early on (Proto-Indo-Europeans) that then mixed in varying proportions to EEF indigenous farmers? 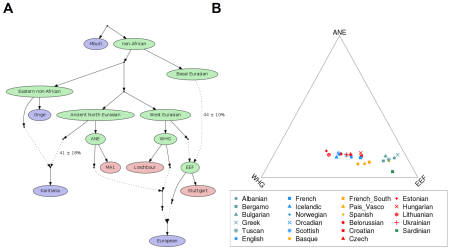 Yes, it seems that a lot of ANE was present in Scandinavia and Eastern Europe during the Mesolithic, so the hunter-gatherer populations in the eastern half of Europe were probably mixtures, in varying degrees, of WHG and ANE. Another wave of ANE then moved deep into Europe during the Copper Age, most likely from what is now southern Russia, and the populations that brought it probably had low WHG and EEF ratios, so they mostly added ANE where they settled.